Since past few years, Micromax and Karbonn have led the way of Indian manufacturers against the global companies. They’re definitely achieving the success, however,in this manner they’re inevitably competing against each other, as well. The Canvas 4 comes in 2 color variants: white and grey. The phone retains the plasticky feel of its predecessor, Canvas 2. The aluminium frame on the sides gives the phone a somewhat premium feel. The back cover is removable and has a glossy finish to it. Overall, the Canvas 4 looks decent but the plastic used in the phone comes off as a little cheap. The Karbonn Titanium S9 has a premium feel to it and the build quality is certainly on par with the Canvas 4. Both devices have displays with a resolution of 720×1280 pixels. The Titanium is sized at 5.5 inches whereas the Canvas 4’s screen measures only 5 inches. Due to its larger screen size, the Karbonn Titanium S9 loses out on pixel density as the Canvas 4’s screen packs a greater number of pixels per inch. This means that the Canvas 4’s display is sharper and crisper than its rival’s display. The Canvas 4 has a battery capacity of 2000 mAh whereas the Titanium S9’s battery has a capacity of of 2600 mAh. Obviously, the Karbonn Titanium S9 has a stronger battery but both devices give similar backup. As the display accounts for a significant part of battery drain, the Titanium S9’s larger display will draw more power and both devices give similar battery backup times. Both phones have a quad core processor clocked at 1.2 GHz powering the hood with 1 GB of RAM and 16 GB on-board storage. A 32 GB micro SD slot can be utilized to expand the memory in both devices. The phones are identical on the hardware front. On the imaging front, both phones have similar specs and deliver similar performance. Both devices come with a 13 MP rear camera, and a 5 MP rear camera. There’s also a LED flash on the backside in both devices. Canvas 4 runs Android 4.2.1 out of the box whereas the Titanium S9 runs Android 4.2. 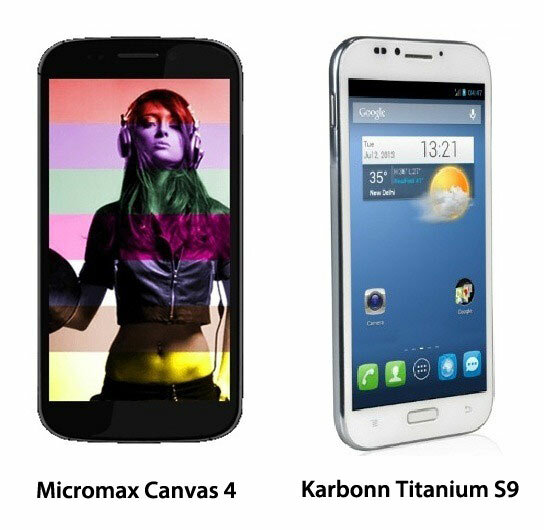 The Karbonn Titanium S9 and Canvas 4 are both dual SIM devices with support for 2 GSM SIM cards. Other connectivity options on the two devices include 3G, WiFi, Bluetooth and USB connectivity. Both phones have a 3.5 mm headphone jack. The Karbonn Titanium S9 has an additional DLNA feature which is missing in the Canvas 4. The Canvas 4 is available at a price of Rs.16500 in the market whereas the Titanium S9 comes at a price of about Rs.18500. A comparison of the specifications of the two phones clearly shows that there aren’t many differences between the two on paper, with the only major difference being Titanium S9’s slightly better build quality. Thus, the price tag and the difference in screen size become the major factors in deciding which of the two phones is better for you. If you’re on a tighter budget and have small hands, the Canvas 4 is a great choice. In case you’re looking for a phablet under Rs.20000, then Karbonn Titanium S9 makes more sense.